Dion C. Joannou has made a career out of adapting to opportunities and making himself flexible in problem-solving situations. One would probably agree Joannou's style has been successful - after all, the 42-year old South African native is president of Nortel North America and at the same time has managed to carve out a full family life with his wife and three sons. "There never really was a master plan for me in searching for a career," Joannou told a roomful of students, alumni, and School of Business faculty members recently during the School's Annual Power Breakfast. "It wasn't until I was a sophomore at SIUE that I really began to think about what I would do as a career." He earned a bachelor of science in business administration with a concentration in marketing at SIUE in 1989 and went on to the University of Miami to earn an MBA in international studies. "My career at SIUE was a very important part of my life," he told the audience. "Because of my experience at SIUE, I decided to stay in the United States." Always thirsting for knowledge, Joannou gravitated to the toughest professors at Miami. "I sought out the professors who pushed their graduate assistants the hardest so I could learn," Joannou said. After graduating from Miami, Joannou took $5,000 he had saved and backpacked around the world. When he came back to Miami, a friend told him of a temporary job available at Motorola-Nortel. Joannou took the job, and after impressing the president of the company, was offered a permanent position. "I began at the bottom, I worked there for 15 years and now I'm the number two man in the company in charge of 5,000 employees," he said. "I didn't plan this, but I did treat every job I did for the company as a project rather than a career. At every meeting, I always volunteered for the challenging jobs. And, when each project was done, I would have a great sense of accomplishment." Such achievement allowed him to rise through the ranks. 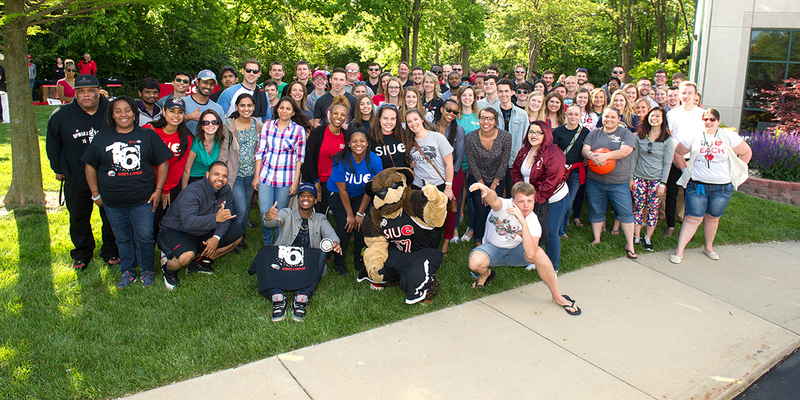 Joannou encouraged students to take full advantage of their experiences at SIUE. "College is the only time in your life when you will have the opportunity to think clearly about the decisions you'll make. Now, I fix problems 24 hours a day," he said. "It's difficult for me to find time to learn." In addition, Joannou stressed that students should learn how to interview, find a mentor, ignore politics in the workplace, and realize that performance is paramount.